Distance to Granada: 35 kilometres. Distance to Costa Tropical: 35 kilometres. Distance to Málaga: 120 kilometres. Distance to Córdoba: 240 kilometres. Distance to Almería: 145 kilometres. Distance to Sevilla: 290 kilometres. How to get to the Lecrin Valley? By Motorway: take the A44 motorway from Granada to Motril (exit 160). By Air: there are three airports reasonably close by. 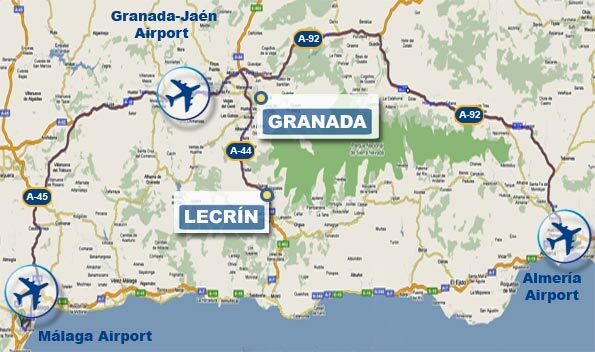 Granada Airport: 50km (approx 45 minutes). Málaga Airport: 180km (approx 2 hours). Almería Airport: 210 km 210km (approx 2 hours 15 minutes). Our company is situated in the heart of the Lecrin Valley, in front of the church in the village of Melegis. Between Lecrín and Melegis there are only 5 Km. 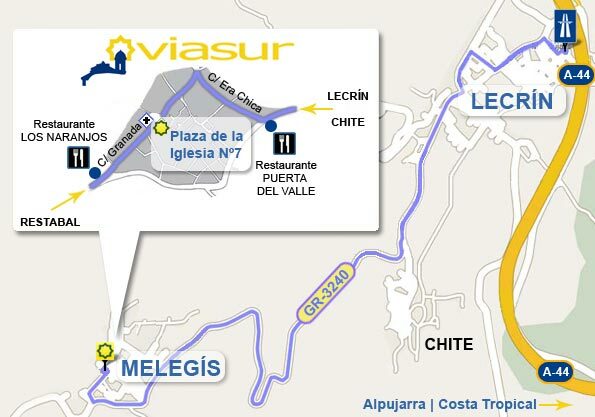 On this map you can use the zoom and the cursor to see the hidden villages of the Lecrin Valley and the Alpujarras.